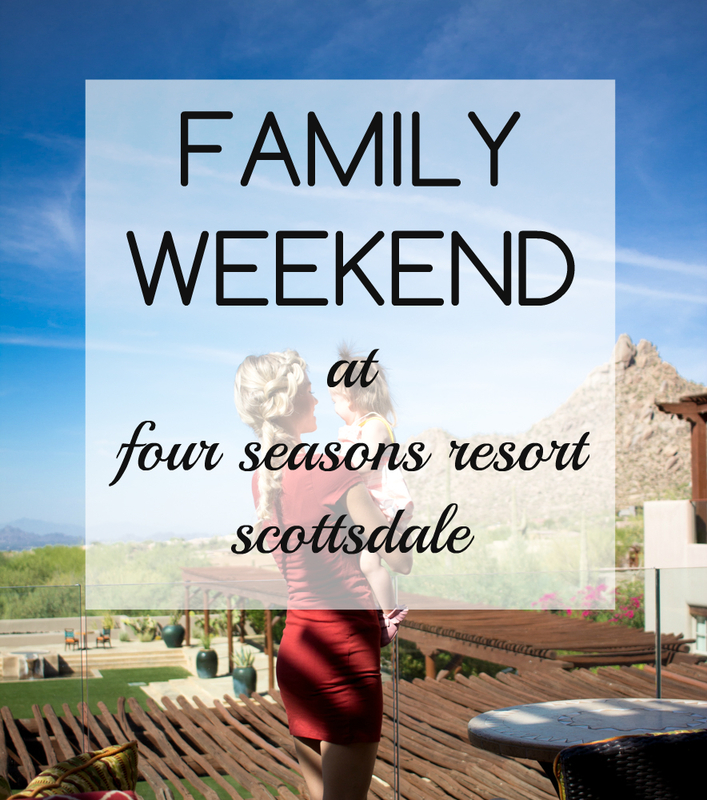 This past weekend our family had the pleasure of staying at The Four Seasons Resort in Scottsdale! This gorgeous Southwestern-inspired space is nestled away in the mountains of North Scottsdale where the mountain views and cactuses are plenty. We were greeted with a freshly picked peach, a jar of Arizona sun tea, a drink and snack for Gracie, and a gorgeously decorated room! I seriously couldn’t believe how friendly the staff was, and how easy it was to navigate the resort! The photo above is Grace and I on our way to breakfast at one of the Four Seasons‘ restaurants, Proof. The breakfast buffet had a ton of options, a gluten-free table off by itself, and the chefs were even kind enough to create a separate vegan dish for Grace and I. I loved that they had kids place and utensils at the restaurants, and the servers enjoyed chatting with and playing with Grace. 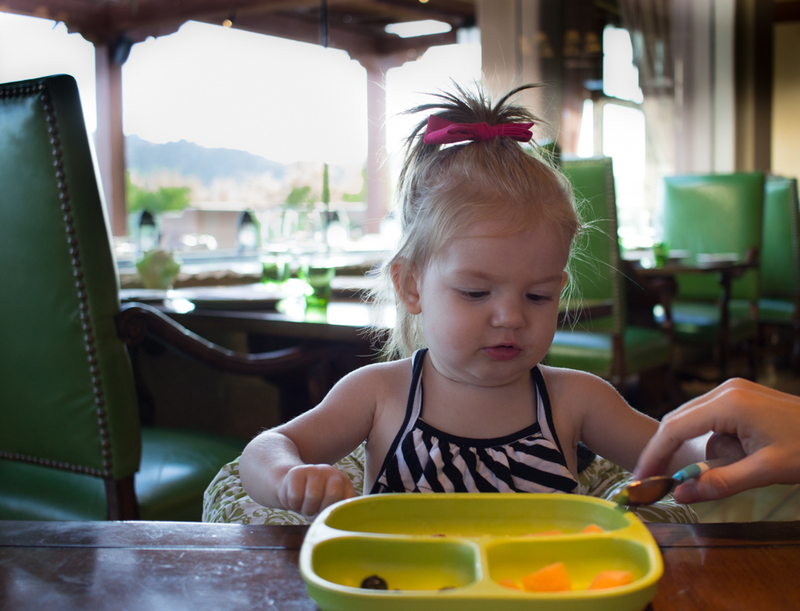 Every time someone would come to our table, she would hand them a grape, or a blueberry (ha!) she was super friendly, and they were loving it! We spent a ton of time by the pool, of course, but when we weren’t swimming, we got to explore the resort! The lobby space is superbly decorated, and is always bustling with just enough people. There was a beer tasting on Friday night [I had a happy hubby!] and a wine tasting on Saturday night. Grace loved dancing and listening to the live music after the wine tasting on Saturday night too! Like I mentioned earlier, we did a ton of swimming. These Kortni Jeane swimsuits were our go-to and we got lots of comments on our mommy & me matching! This photo was taken in front of the kiddie pool. It’s one foot deep all the way around, so I felt super comfortable with Gracie splashing around. There is also another larger pool with shaded cabanas near the restaurant Saguaro Blossom. We loved having the restaurant poolside. My absolute favorite part of our stay was the views. The view from our room was incredible and overlooked the city. It seriously had us in awe, during the day and at night when it was all lit up, and then this view from the outdoor deck. The skies were just breathtaking, and in this space I felt so thankful to be spending this time with my sweet little family, even if it was for only a weekend, I came home super relaxed and rejuvenated! Cute! You're so tiny are you sure you popped that baby out! Your matching swimsuits are so freaking cute. Love these shots of you two!